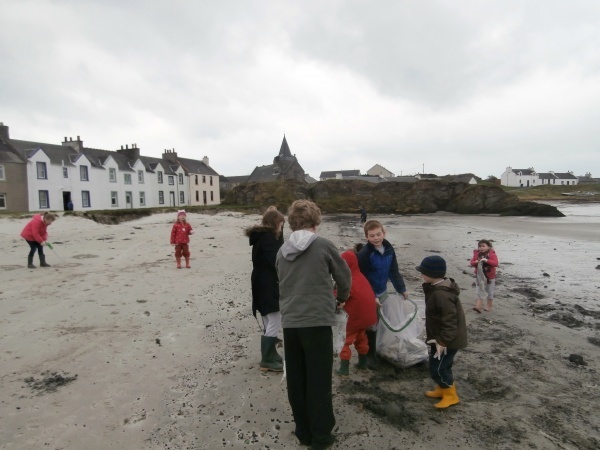 On Friday we all went down to the beach for a beach clean. The storms last week had uncovered lots of plastic bags down near the water line but within an hour the beach was looking good again. The Litter Police have just got their new grabbers and gloves and are patrolling the grounds looking for litter. Ideally they should find none….so remember to use the bins properly! 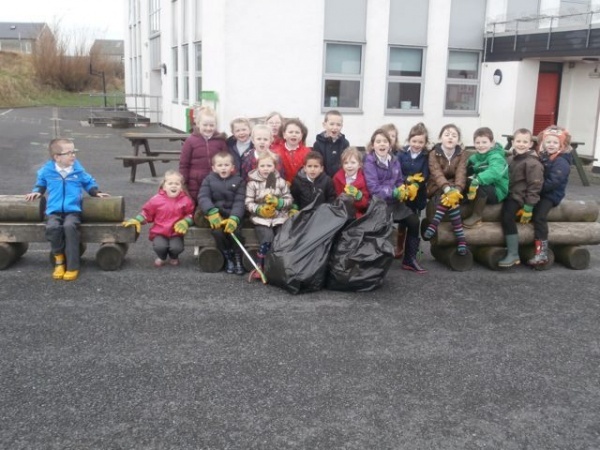 At their Joint Sessions, the Pre-5 unit and P1/2 have been learning about the 3rs – Reduce, Reuse, Recycle. 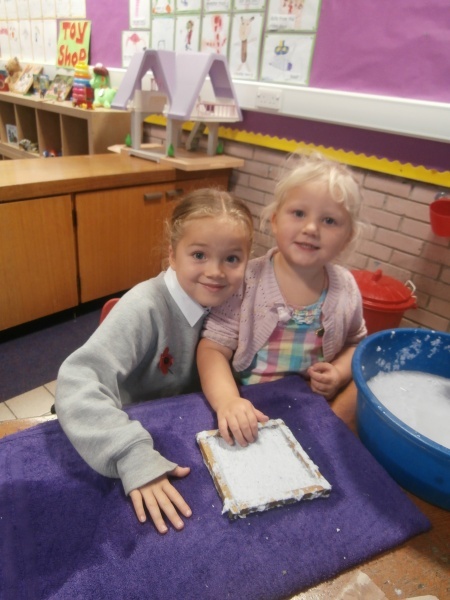 They enjoyed making fabulous pictures using their unusual art materials – straws, pompoms, beads, lolly sticks….but no glue! This means that the material is not wasted but reused each time. Children took pictures of their art instead. The Pre-5 unit and P1/2 made their own Eco Superheroes that are going to save the world. They discovered that they can be eco-heroes too and decided what they could do to help the planet. Check out their ideas on the noticeboard….and add your own. Look out for the Green Eco Hero in nursery! Have you ever noticed the little triangles on the bottom of plastics for recycling? The Pre-5 children and P1/2 have been investigating a recycling bag to see which numbers were in the greatest number. Here are their results. This was our first eco meeting with the new committee. 2. We met everyone and found out about our roles. 3. Action Plan – We went over the action plan. For the next meeting we have to decide what we want to start with. We will start with 3 action points. 4. Green Flag – Our assessment is on 24.11.14. We will decide what we need to do at the next meeting. 5. 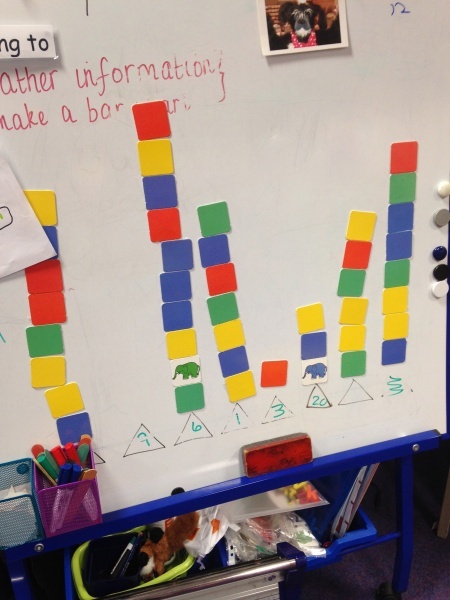 Getting the whole school involved – we talked about ways to get everyone involved. New noticeboard. Eco-assembly. New eco-code in all classes. Eco-committee to decide action points. Anwen to come up with fundraising ideas. Mrs Harrison to arrange date of eco assembly. 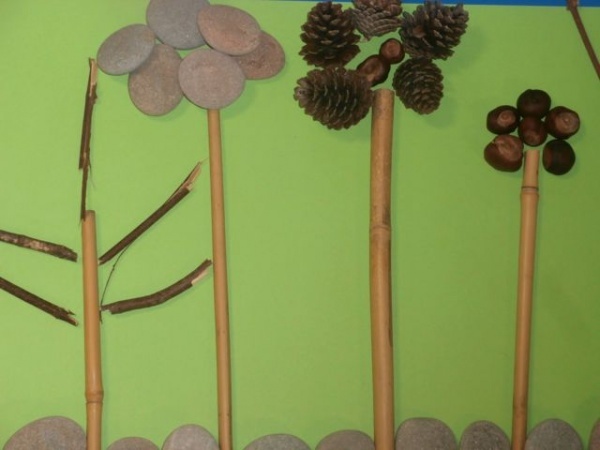 Media group to make eco code posters. Secretary to arrange photos of everyone for the wall. Our second attempt at making recycled paper, at the Pre 5 and P1/2 joint session, produced a much nicer looking paper! And the wee ones loved sloshing about in the paper pulp! At the Pre-5 and P1/2 joint session the children were learning about recycling. 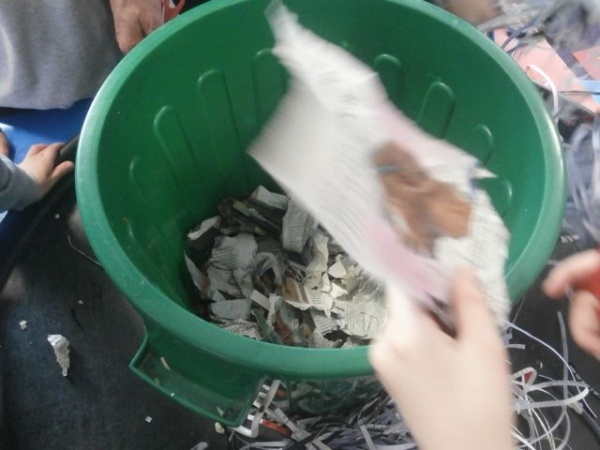 They sorted materials and decided which could be recycled. 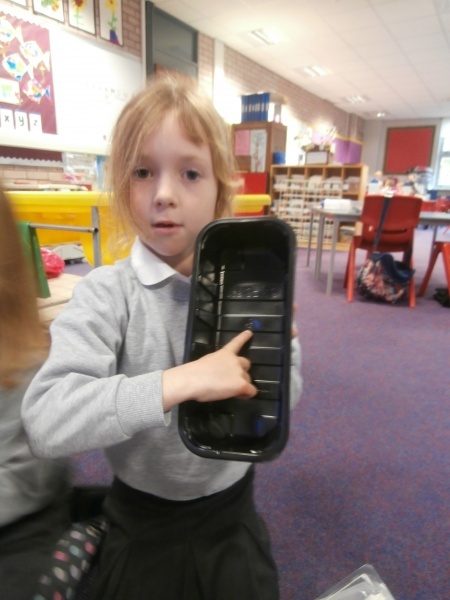 They looked for the triangular recycling marks on the plastics and discovered lots of different numbers – because there are lots of different types of plastics. These can all go in our pink recycling bags at home! 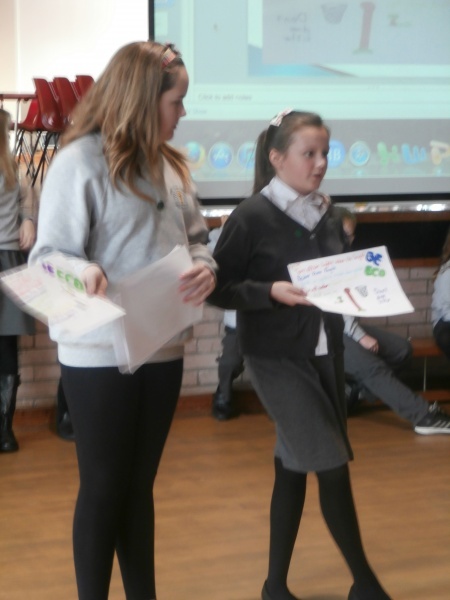 The new eco committee held their first eco assembly. Eco monitors from each class reported to the school what had been happening in their classes – even our Pre-5 eco monitor who closes the door, switches off the light and helps take the fruit peelings to the worms! The committee shared their ideas for the coming year with the school. 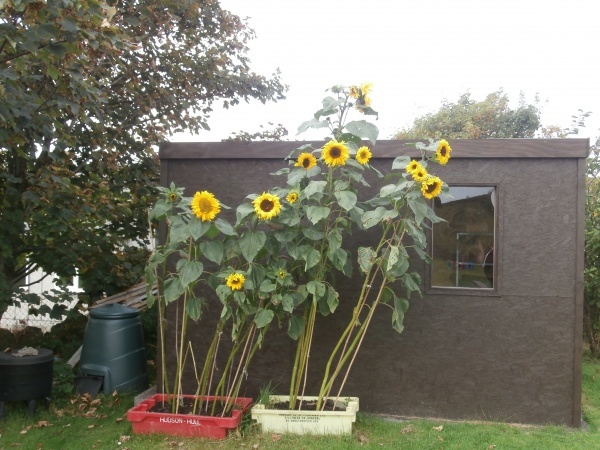 Our fantastic sunflowers, planted by P3/4 last session have finally collapsed in the wind…..but the Pre-5 unit have saved the heads and the birds are now enjoying sunflower seeds for lunch!